FEATURES * High sensitivity for the VHF & UHF frequency measurement, useful for the CB amateur. * Handheld & pocket size instrument. * Wide measuring range up to 2.6 GHz. * Good resolution, 0.1 Hz min. display unit for 10 MHz range. * Used the exclusive Microprocessor IC offered the intelligent function: Frequency, Period, Multi resolution, Data hold, Relative measurement, Data record( Max., Min., Average reading). * Auto power off & manual power off. * LCD display for low power consumption & clear read-out even in bright ambient light condition. 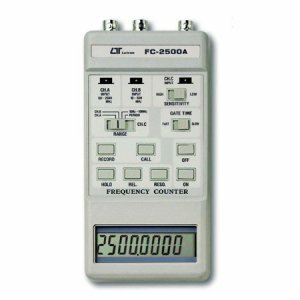 FEATURES * Deluxe function generator combined with a 5 digit, high resolution 60 MHz counter. * 4-in-1 instrument : Function Generator Pulse Generator Sweep Generator Frequency Counter. * 6 waves forms for function generator. * Function generator range : 0.5 Hz to 3 MHz.